on Central Avenue at the foot of the Sandia Mountains, just south of I-40. in Albuquerque, New Mexico. 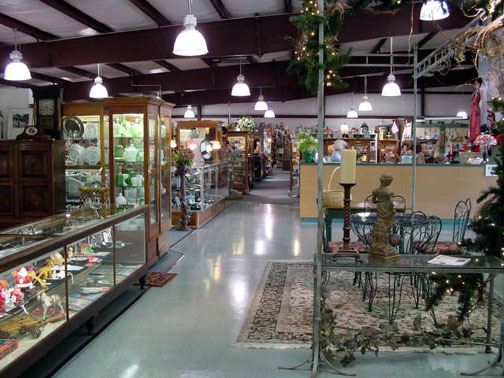 Our mall features everything from wonderful vintage jewelry to furniture, kitchenware to sterling, man-tiques to Shabby Chic, and Victorian to Modern. Truly something for everyone. 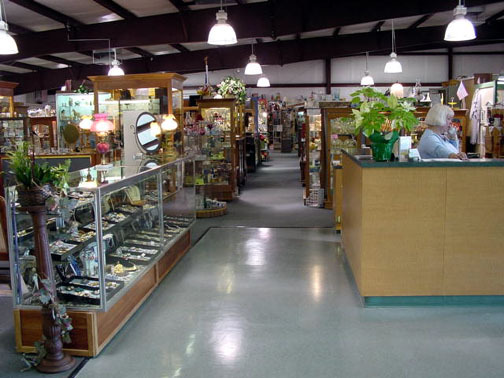 We'll give you a friendly welcome, with knowledgeable dealers always here to assist you, thousands of great antiques and collectibles from which to choose, and maps to all the other antique shops in the area. If there is something in particular you collect or are looking for, email us by clicking HERE. 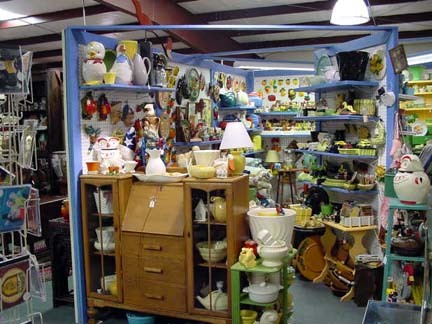 We have a large inventory, and it changes every day. Come on by if you're ever out our way... the coffee is always on! 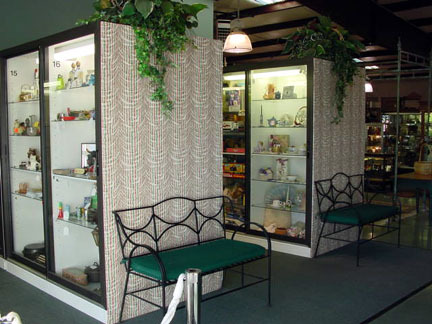 Here's a walk through the aisles of the ANTIQUE CONNECTION MALL at 12815 Central NE in Albuquerque, New Mexico. 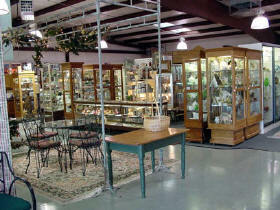 Come on by and see it all, as well many knowledgeable, friendly dealers. The coffee is always on and we have wide aisles, clean booths and bathrooms, and maps to other malls in the city. 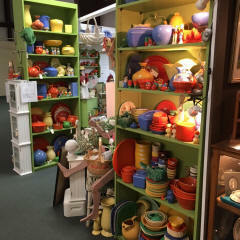 A really colorful collection of 40s and 50s dishes like Bauer, Luray, Fiesta, and more. What a fun way to brighten your kitchen! And the prices are super reasonable. 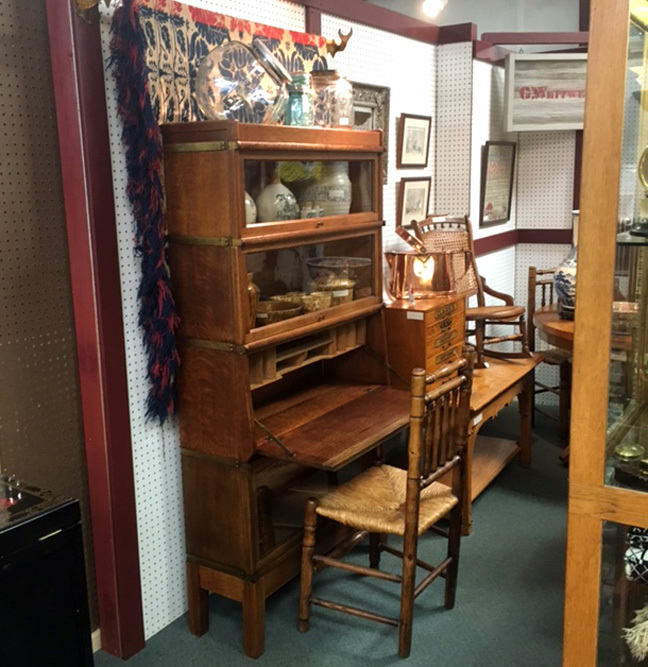 Globe Wernicke oak lawyer's bookcase/secretary with a drop-down desk, this is the best of it's kind. In excellent condition and hard to find these days, you can buy it at the Antique Connection Mall in Albuquerque, New Mexico, come on in! 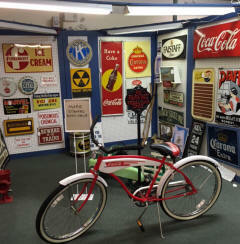 SIGNS- advertising signs for oil, gasoline, Coca-Cola and more, as well as a 1980s Huffy Coke bike. 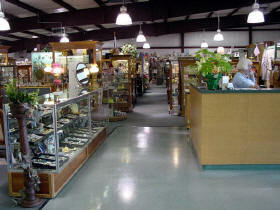 Dealers bring in more every week, so don't miss it if these are your bag! You can buy it at the Antique Connection Mall in Albuquerque, New Mexico, come on in! We buy and sell every day! To contact us, please email us by clicking HERE. 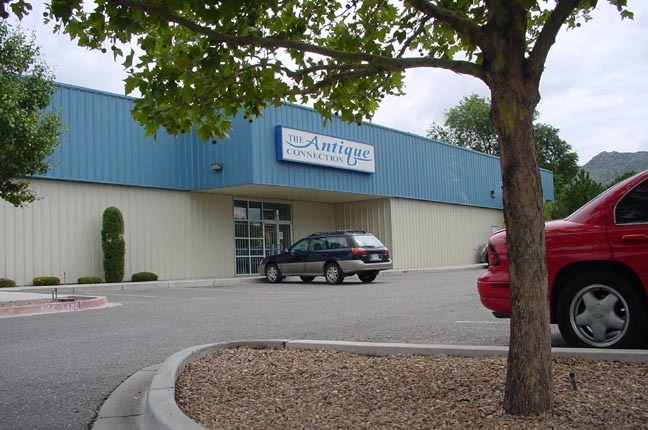 If you WANT TO JOIN US AS A DEALER, please click HERE for information. For a map on Google, please CLICK HERE. 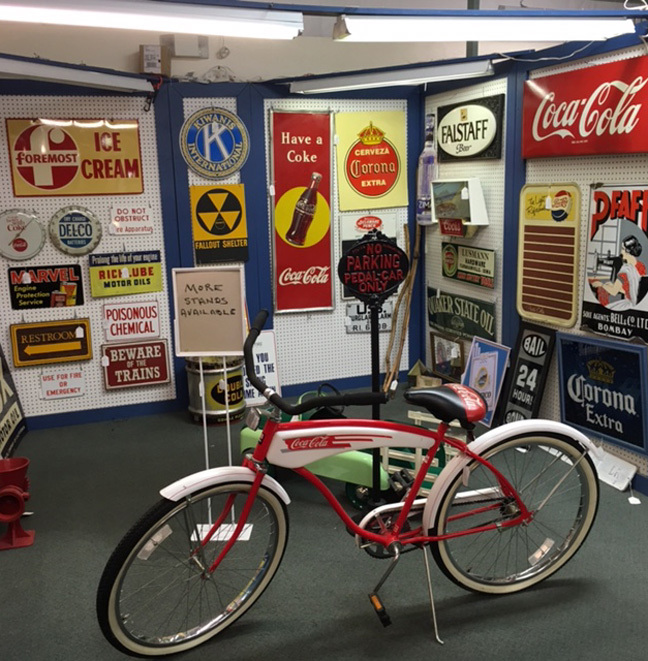 We are on Central Avenue (Historic Route 66) right at the foot of the beautiful Sandia Mountains on the far east side of Albuquerque, New Mexico, just off of Interstate 40. Coming to town from the east, take the first exit off of Interstate 40 (Central Ave-Tramway. 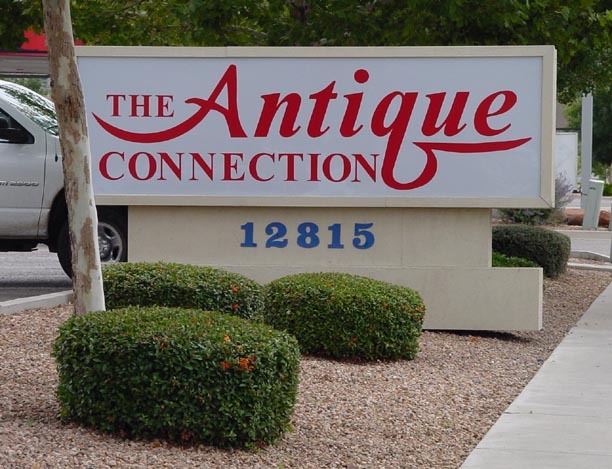 Head west on Central Avenue and watch for our tall street sign on your right-hand (north) side. If you are coming from the west, stay on Interstate 40 almost all the way to the foot of the mountains at the east side of Albuquerque. Exit I-40 at the Juan Tabo Blvd exit and go south (right). Take Juan Tabo to Central Ave, and turn left (east, towards the mountains). Watch for our sign on your left. On your maps, we are half way between Tramway Blvd. & Juan Tabo Blvd. on Central Avenue, just south of Interstate 40. 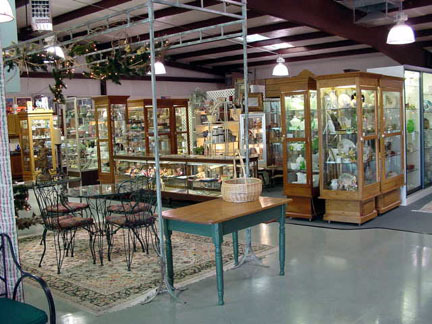 Welcome to the Antique Connection Mall in Albuquerque, New Mexico. As you come through the door, our wonderful front showcases are on your left.... ... and the cashier's desk is on your right. 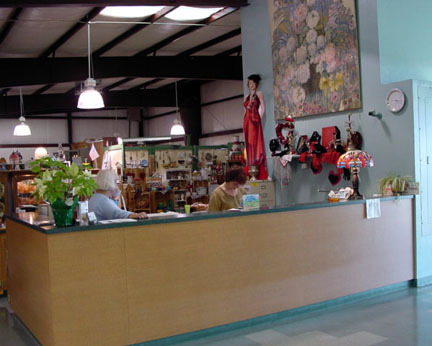 Our knowledgeable staff can answer questions and assist you with your purchases. Feel free to make yourself at home at the table under the arbor. We will look forward to seeing you soon! 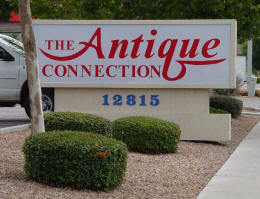 ... and we can direct you to other antiques malls, Albuquerque's best restaurants, and area interests. Jewelry... Georgian & Victorian antique, vintage and collectible jewelry, rhinestone, bakelite, sterling, purses and accessories. 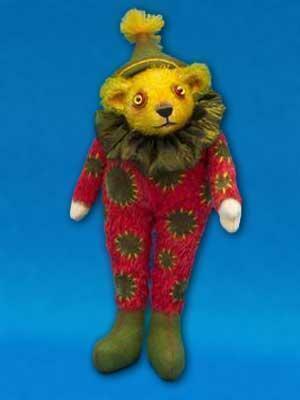 There is also an extensive reference and gallery feature on this site. 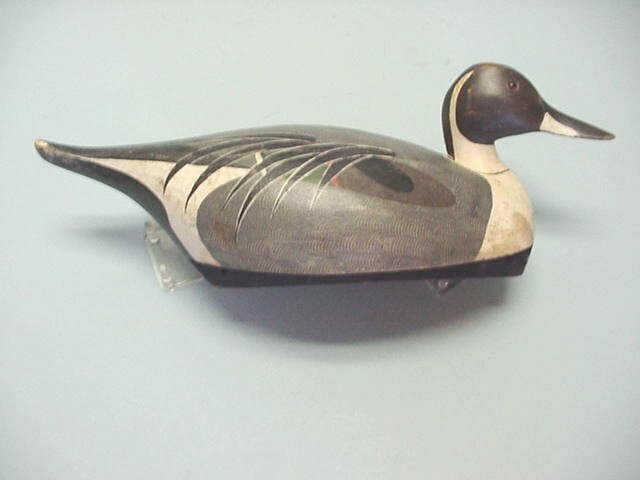 Specializes in fishing, hunting and outdoors collectibles including decoys. Specializing in 1930s-1950s pottery, linens, glass and accessories as well as stuffed animals and furniture. AND ALSO BOOKS of all kinds!